The weather is getting warmer and that means music festival season is fast approaching all around the country. With Wakarusa moving to the state a few years ago, and the organizers of that successful festival starting up several new events combined with a pretty great line up of established festivals already happening around the state, and one could argue that Arkansas has as impressive a lineup of music festivals within its borders as any other state in the country. We compiled a list of 10 music festivals coming up in either in the next few months, and that’s not counting some great festivals that have already happened in 2015 (Valley of the Vapors in Hot Springs or the University of Arkansas’s new Springime of Youth Festival come to mind, among others). In the coming months, you can see artists like Sheryl Crow, Jake Owen, Halestorm, Big K.R.I.T., Bone Thugs-n-Harmony Ben Harper & The Innocent Criminals, Zac Brown Band, Carrie Underwood, Railroad Earth, Chris Robinson Brotherhood, Lucero, Jason Isbell, The Punch Brothers, Watkins Family Hour (Feature the Sean & Sara Watkins of Nickel Creek, Fiona Apple, and Don Heffington), Robert Randolph & The Family Band, Paul Thorn, Bobby Rush, Taj Mahal, STS9, The Disco Biscuits, Yonder Mountain String Band, and tons of other marquee artists on a festival stage somewhere in The Natural State. Here’s our list of ten upcoming music festivals you can check out without ever leaving the state of Arkansas. Tickets: Tickets range from $25 for a three day pass, to $500 for a VIP two pack. Purchase online here. Lineup: Riverfest always has a diverse lineup, and that trend continues this year. Headliners span genres as always, and include Sheryl Crow, Jake Owen, Halestorm, Big K.R.I.T., Bone Thugs-n-Harmony, The Pretty Wreckless, Kris Allen, 311, Kip Moore, Galactic (with Macy Gray), Sam Hunt, Sister Hazen, and Robert Earl Keen. 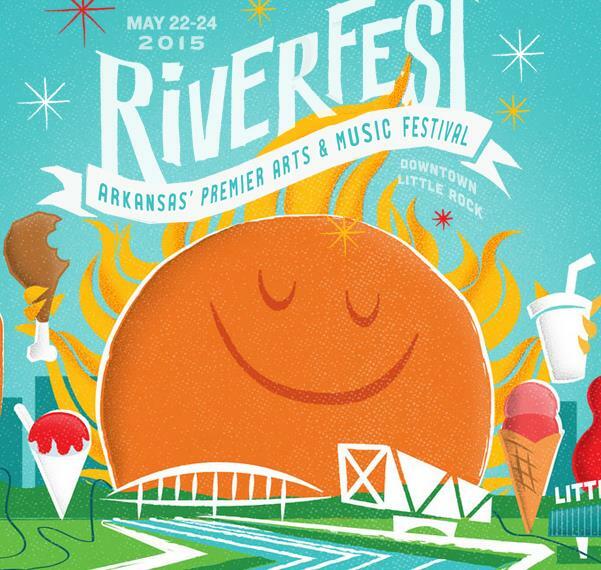 More info: Riverfest is more than just a music festival. The event also includes an opportunity to rappel off the side of a 14-story building, a kid zone, a merchant area with arts & crafts, a craft beer and wine tasting area, a baggo tournament, and more. For more information, visit riverfestarkansas.com. Tickets: General admission tickets range from $69 for a Sunday pass, to $204 for a full event pass. VIP tickets are also available. Purchase online here. Lineup: Wakarusa’s lineup is always pretty eclectic, but it typically focuses most on up and coming acts, jam bands, bluegrass, Americana, electronic, and indie music. Headliners for this year’s event include Ben Harper & The Innocent Criminals, Major Lazer, The Roots, Thievery Corporation, STS9, Umphree’s McGee, Slightly Stoopid, Chance the Rapper, and several others. 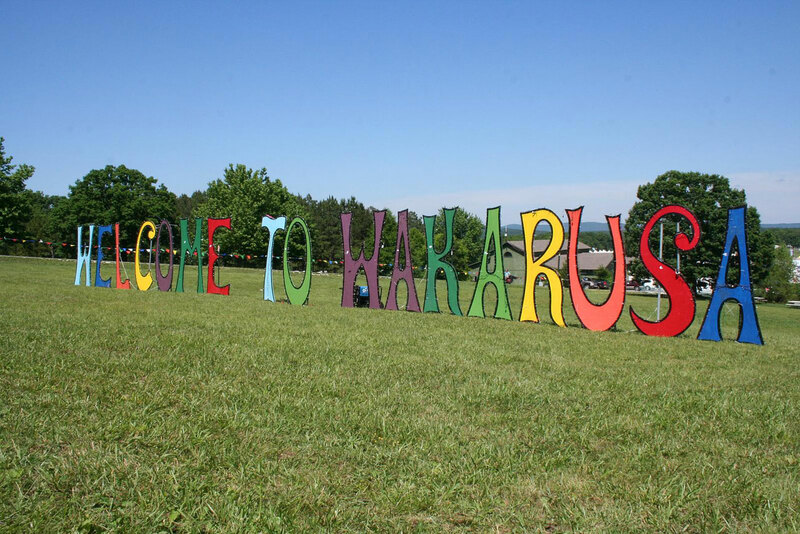 More info: One of the best features of Wakarusa is the beautiful setting organizers have planned the festival in on a farm on the scenic Mulberry Mountain. There’s plenty of hiking to be done from the festival grounds, camping, as well as plenty of arts and craft vendors, festival food, and more. For more information about Wakarusa, visit Wakarusa.com. Tickets: Weekend passes are $75, and individual tickets are also available. Purchase tickets here. Lineup: A week long blues festival at locations all over Eureka Springs. Artists include Shari Bales, The Bel-Airs, Brick Fields, Brody Buster, Doghouse Daddies, Earl & Them, Shawn Holt & The Teardrops, and others. More info: For more information, visit eurekaspringsblues.com. Tickets: Tickets range from $79 for a single day pass, to $159 for a three day pass on a payment plan. VIP passes are also available. Purchase online here. 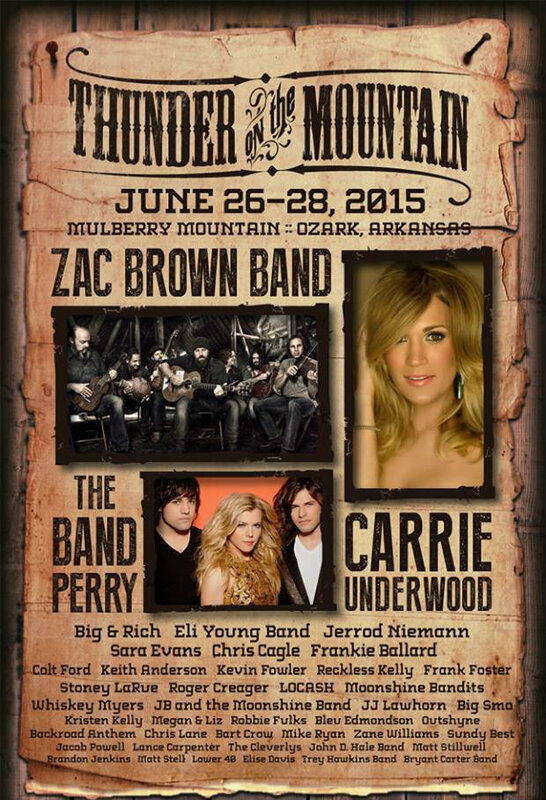 Lineup: Thunder on the Mountain is only a few years old, and it didn’t happen at all last year, but it’s has to be one of the best country music festivals in the country. This year’s lineup certainly reflects that status, with a who’s who of Nashville stars including Zac Brown Band, Carrie Underwood, The Band Perry, Big & Rich, Eli Young Band, Sarah Evans, Jerrod Niemann, Chris Cagle, Frank Ballard and others. More info: Organized by the folks behind Wakarusa and set in the very same Mulberry Mountain location, Thunder on the Mountain boasts all the same hiking/fishing/camping and outdoor amenities that it’s sister festival does. The festival also includes a farmers’ market, mechanical bull riding, vendor booths, and festival food. For more information, visit thunderonthemountain.com. More info: Known as “the best little festival in America,” Fort Smith’s Riverfront Blues Festival is one of the longer running music festivals in Arkansas. For more information, visit riverfrontbluesfest.org. Tickets: Tickets are $90 for a three day pass. Friday/Saturday, and Saturday only options are also available. Purchase tickets here. Lineup: Lineup includes Railroad Earth, Keller Williams, OTT, Earphunk, The Schwag, Random Lag, and others. More info: A new festival over Fourth of July weekend on the Mulberry River. For more information, visit highberryfestival.com. Tickets: General admission tickets range from $15-30. Purchase online here. Lineup: Peacemaker Festival is a new event planned in downtown Fort Smith, and the lineup for the event is looking strong. Headliners this year include Chris Robinson Brotherhood, Lucero, Jason Isbell, Corey Smith, and Anders Osbourne. More info: For more information, visit peacemakerfest.com. Tickets: Tickets range from $39 for a Sunday pass to $219 for a four-day festival VIP pass. Purchase online here. 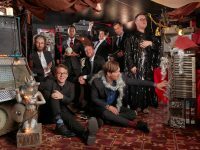 Lineup: The Fayetteville Roots Festival is becoming well known around the country for quality folk, Americana, bluegrass, and roots music, and this year’s lineup carries on that tradition. 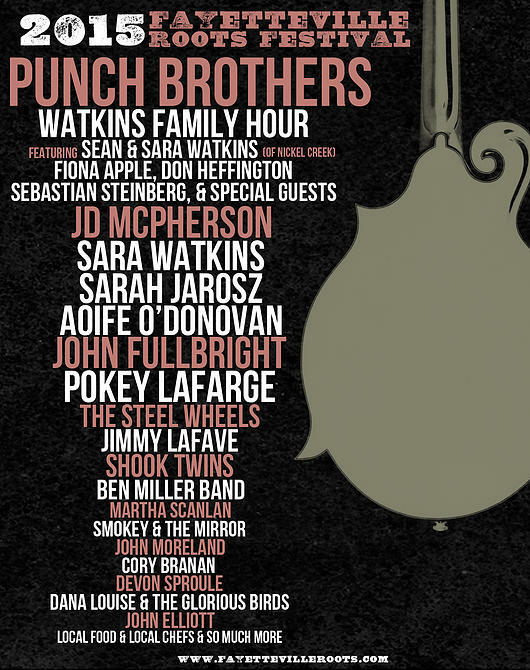 Headliners this year include The Punch Brothers, Watkins Family Hour (Feature the Sean & Sara Watkins of Nickel Creek, Fiona Apple, and Don Heffington), JD McPherson, John Fullbright, Pokey LaFarge, The Steel Wheels, and others. 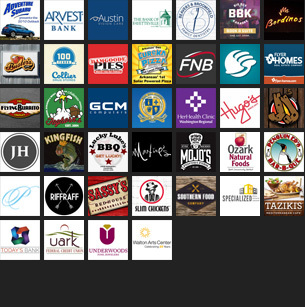 More info: In addition to the music, Fayetteville Roots Festival also has a pretty large local food component. The festival highlights local farmers and chefs, and the event kicks off with a huge VIP party featuring a pretty incredible spread, local beer, and great music on the Garner Farm in east Fayetteville. 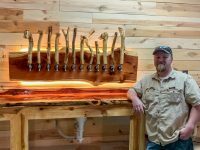 For more information, visit fayettevilleroots.com. Tickets: Tickets are $30 for all three days for a limited time. Purchase online here. Lineup: Robert Randolph & The Family Band, Paul Thorn, Bobby Rush, Taj Mahal, Lucky Peterson, Jimmy Burns Band, The Cate Brothers, Samantha Fish, Kentucky Headhunters and others. More info: The King Biscuit Blues Festival is turning 30 this year, and they’ve got quite a celebration planned. For more information, visit kingbiscuitfestival.com. Tickets: Tickets range from $164 for general admission to $524 for a VIP pass. Purchase online here. Lineup: The Yonder Mountain String Band Harvest Music Festival on the Mulberry Mountain has merged with the upstart Phases of the Moon Festival, and will be held on Mulberry Mountain this fall. The lineup is similar to what we’ve come to expect from Harvest Fest, and was just released earlier this week. Headliners include STS9, The Disco Biscuits, moe., Yonder Mountain String Band, Lunar Landing Conspiracy, Beats Antique, and others. More info: For more information about the Phases of the Moon festival, visit phasesofthemoonfestival.com.